Sometimes I feel like we give so much attention to pinot noir that it’s like lavishing all your attention on one child in the family at the expense of other siblings. It’s even worse when you live in the Mid-Valley because there is so much pinot noir grown and produced in our area. According to the 2010 Oregon Vineyard and Winery report, 2,665 acres are planted with pinot noir in Marion and Polk counties out of a total of 12,406 acres for the entire state. But you don’t have to go too far to stumble on some grapes that are rising stars, such as tempranillo in Southern Oregon. Acres planted with tempranillo are dwarfed by pinot noir. According to the 2010 report, only 174 acres were planted with tempranillo in the entire state. 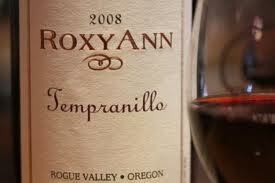 Tempranillo is native to Spain, where it’s used to make full-bodied red wines. It’s the main grape used in Rioja. And it turns out that this grape variety thrives in the Umpqua and Rogue valleys’ short cool springs, followed by long warm summers and a short autumn. Wines made from tempranillo are generally dark ruby-red in color, with flavors of berries or plum.